This May, Renegade Game Studios will release J. Alex Kevern�s game of tunneling thieves, Prowler�s Passage. In Prowler�s Passage, the players are thieves who have devised a clever scheme for bypassing the vigilant guards of the city: by digging a network of tunnels underneath their feet. During the game, the players will construct their tunnels using the game�s passage sections. The tunnel networks can be used to gather up valuable loot, of course, but also for control of the various districts of the city. Points can also be acquired by completing achievements during the game. 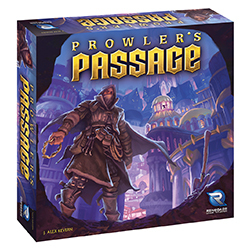 Prowler�s Passage will include 1 control track, 10 board hexes, 27 object tiles, 5 control markers, 4 statues, 15 Achievement cards, 26 Passage sections, 2 reference cards, and a scorepad with pencil. The game is a head-to-head match between 2 players, ages 12 and up, that takes a little less than half an hour to play.